It doesn’t get much better than a tour of America’s most famous roads aboard its most famous motorcycle. To be clear, this wasn’t the SCMA sanctioned ride to the four-corner cities in the U.S. (San Ysidro, CA; Blaine, WA; Madawaska, ME; and Key West, FL) in 21 days or less. 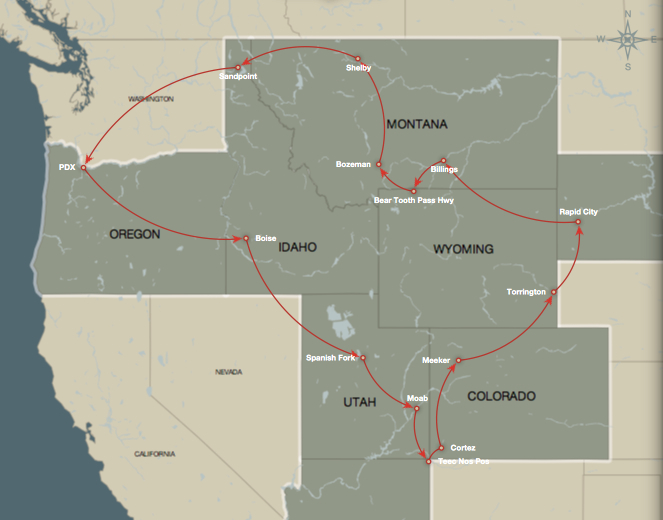 I’m talking about the 4-corners of Arizona/ Colorado/New Mexico/Utah which is a leisure trip in comparison. I’m very late in posting a summary, but about 10-months ago, three of us set out for the mystical 4-corners. It turned into a 4000-mile journey over a couple weeks that led us through Eastern Oregon, Southern Idaho, Utah, New Mexico, Arizona, Colorado, Nebraska, Wyoming, South Dakota/Sturgis, Montana, Northern Idaho, Washington and then back to Oregon. My view is that any motorcycle is better than a car, and not for the biker type reasons, it’s because you engage with the environment and the people in a far more intimate way. When it rains, you get wet, when the temperature drops, you get cold, and if those sound like reasons to take a car, then you just don’t understand – feeling the air and the weather rather than viewing it through a windshield or soaking in the experience of the environment instead of merely looking at it truly is the only way to go. On this road trip, Moab, the Million Dollar Highway and Beartooth Pass were my most memorable highlights. 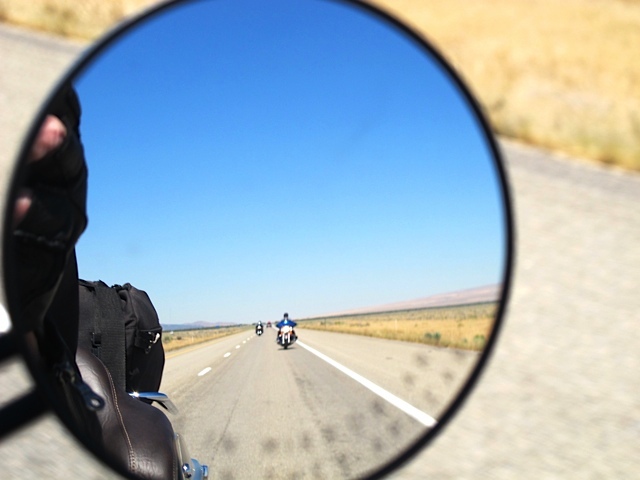 The road trip was much more than just a motorcycle ride. We were exposed to multiple days of 100+ searing heat, dodged wildfires and rode through hail and torrential rain storms with “mud-flows” on Colorado’s Highway 110 where fishing gear seem appropriate! Nothing we couldn’t handle and it all made for the adventure of touring by motorcycle. 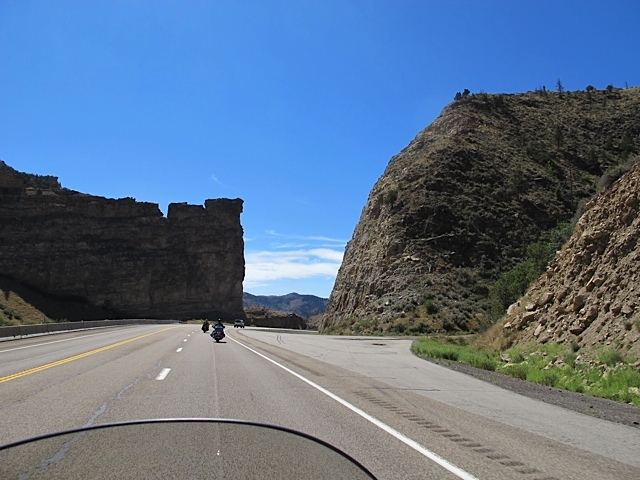 Portland to Boise – I’ve blogged ad nauseam about riding from Portland to Boise on various trips to Sturgis and won’t bore you by repeating the details. We departed early and it was about getting some miles under our tires with I-84 being the fastest route east. 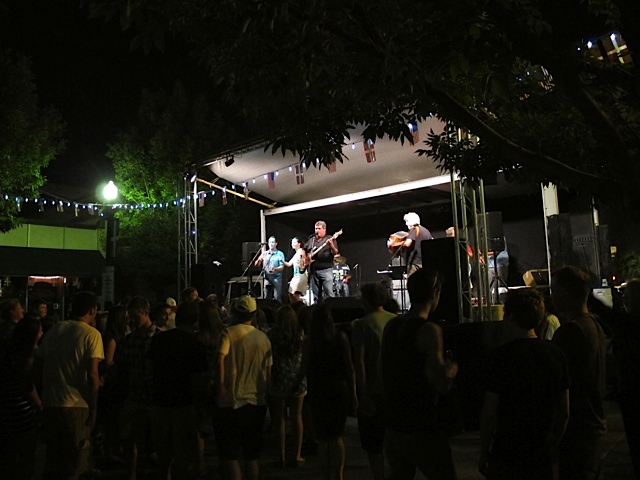 We overnighted in Boise where the perpetual street scene celebration seems to always be running. We grabbed some dinner at the Reef “Tiki” Restaurant. Boise to Spanish Fork, UT – We departed Boise fairly early and continued to roll on the freeway through semi-arid rolling hills. We were not fully into the “tourist” mode until we stopped in Spanish Fork, UT outside Salt Lake City. We did a quick stop at Timpango’s Harley-Davidson. The 6-acre complex and building was the brainchild of Dave Tuomisto and was a great story. It was a mega-dealer – almost a mini-museum – and part of Harley-Davidson’s growth strategy, but during the “Great Recession” fell on bad times and Joe Timmons purchased the dealer for pennies on the dollar. It’s a unique complex and well worth a stop if you’re ever in the area. The most memorable item I recall from this part of the trip – I’m writing this post nearly a year later – was the incredible amount of road construction on I-15 in and around Salt Lake City. It’s as if there was a mass-transit revolt by residents and the state decided to build enough lanes to accommodate traffic into the late 21st century. There was no time for day dreaming as car’s cut us off and darted across multiple lanes. Spanish Fork to Moab – On this day the ride was all about mountains. US-6 leads to Moab and Arches National Park and from the first mile we were climbing. The grade was mild so the elevation stretched out for miles until we finally reached the summit at 7500 feet. All the while peaks with short scrubby trees surrounded us. 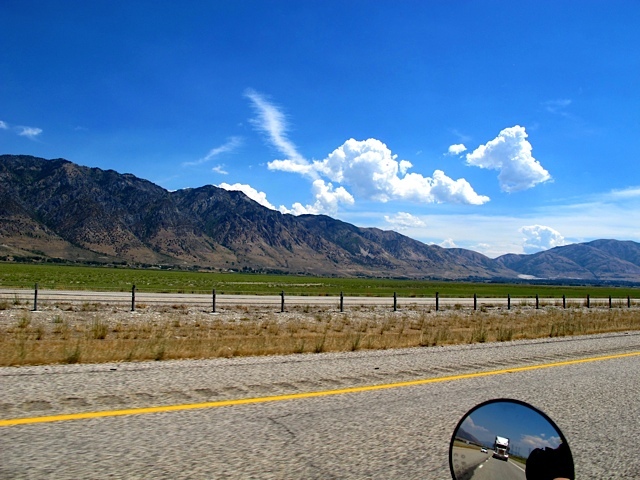 US-6 between Spanish Fork and Price has the honor of being one of America’s most dangerous roads owning it to a mix of heavy trucks, RVs and cars traveling at freeway speeds through narrow canyons. There were 519 fatal and serious accidents from 1996-2008. The descent from the summit was much quicker though it didn’t seem all that steep and we ended up on I-70 at a Papa Joes Gas-n-Go station where we fill up the fuel tanks. We headed east on I-70. Most people will take Highway-191 at the Crescent Junction interchange into Moab. There are over 8500 cars that travel this road daily. 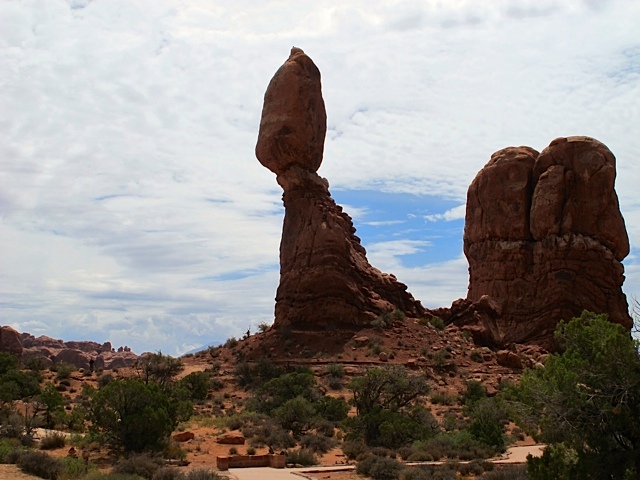 We decided to take a less-traveled route that adds only a few miles and you come into Moab from the back side on Highway 128. 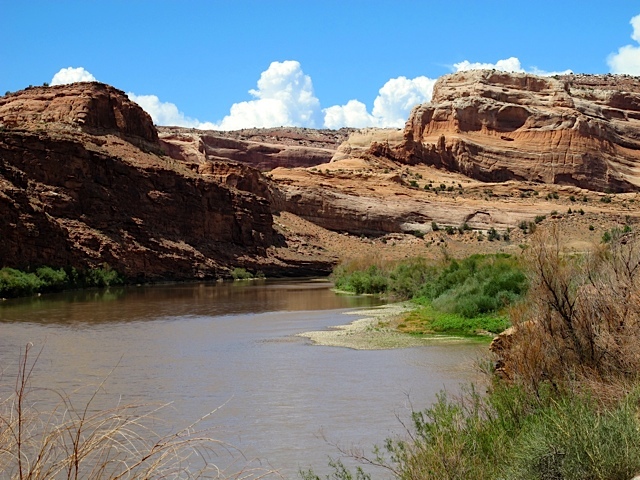 This spectacular 44-mile scenic byway meanders along the Colorado River and the lack of vehicles was a bonus. 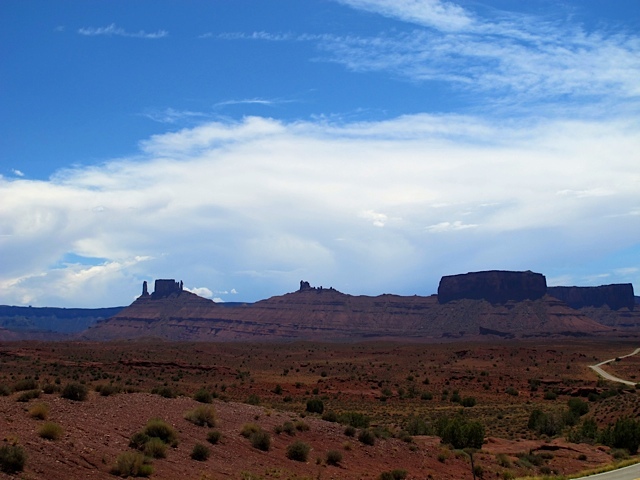 About halfway you pass a viewpoint of the red rock spires of the Fisher Towers which is set against the peaks of the La Sal Mountains. It was an impressive scenic ride with the red sandstone walls rising up around us as we watched the colors of the sunset. It was a day of searing heat and we headed to the Best Western Plus Greenwell Inn pool to cool down. We had dinner at the Moab Brewery and reviewed the “tourist” plans for the next day. 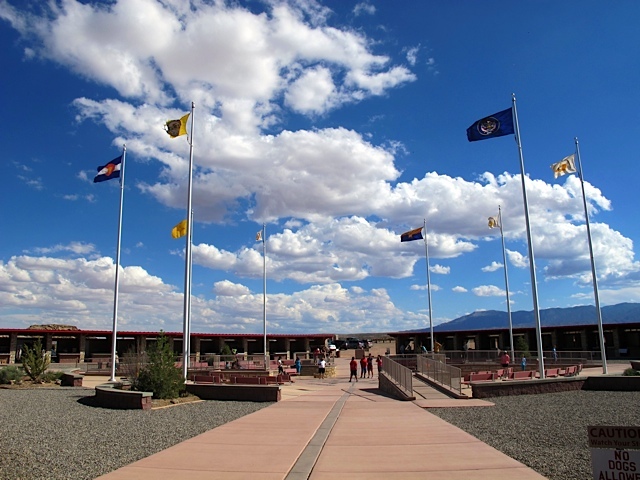 Moab to Cortez, CO (with stop at 4-Corners Monument) – We awoke early to get a jump on the desert heat and rolled out of town in the cool morning toward the River Canyon. 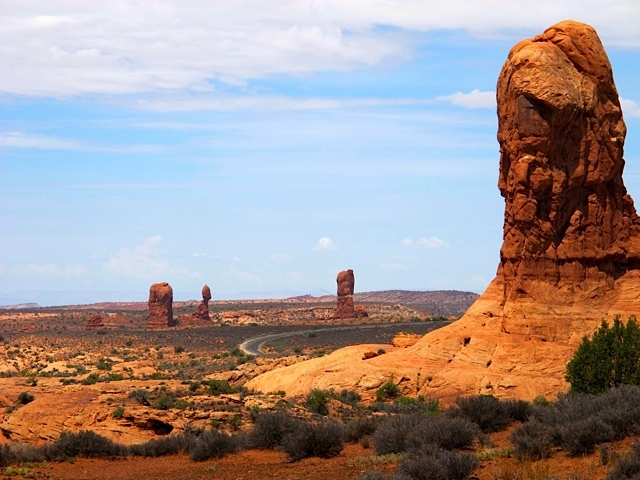 The plan was to ride the loop in Arches National Park and do some tourist sightseeing early then rumble toward 4-corners. 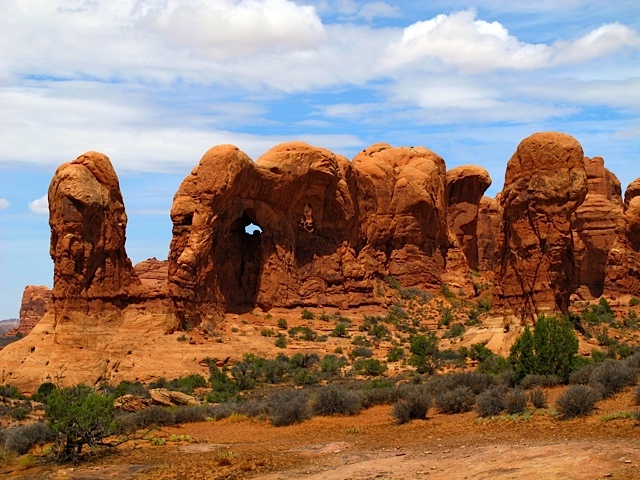 There have been good books written about Arches and this simple post will not do it justice. We rode most of the 36-mile round trip scenic drive. We rolled through the petrified sand dunes between “Courthouse Towers” and “The Windows.” We stopped and walked around a bit at “Balanced Rock” and again at Elephant Butte near the “Parade of Elephants.” Unfortunately we didn’t have the time or were we dressed appropriately to walk the 1.5mile hike into “Delicate Arch.” We took a lot of photos and then exited the park. We headed south on Highway 191 where the only sound was of the V-Twin rumbling off the canyon walls. Horses nuzzled the rough cottonwoods by the riverbank and the red sandstone walls rose up around us again as we headed toward Monticello and Blanding. 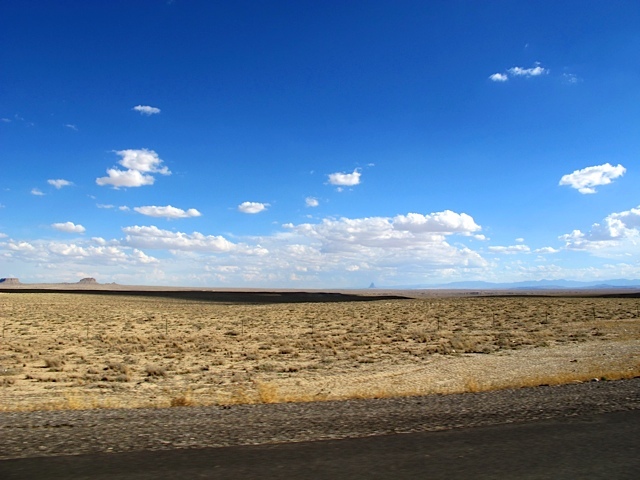 I don’t exactly remember which route we took to Montezuma Creek – all roads looked similar – but we ended up in Teec Nos Pos, AZ and then connected to Highway 160 for the 4-corners monument. We paid the fee to get into the park and walked around, did some shopping at the Indian vendor stands which wrap around the monument area. 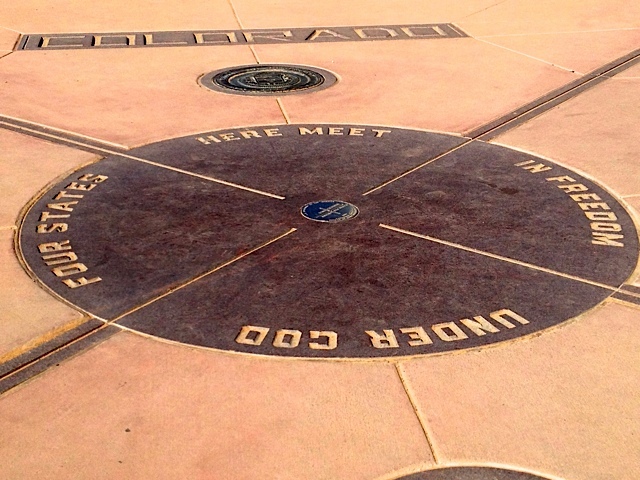 It was cool to stand on the 4-corner disc and straddle the four states. It was getting late in the day and we really needed to find a town large enough to host a motel so we departed. 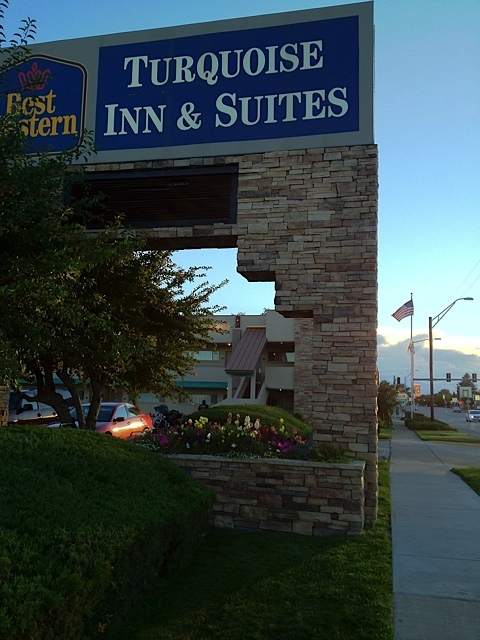 We headed north on Highway 160 and overnighted in Cortez, CO., at the Best Western Turquoise Inn & Suite. It was another scorching day of heat so a quick dip in the pool was in order and then we headed to dinner to discuss the next day riding plans. This is a multi-part post. Part-2 continues HERE. Photos taken by author. Map courtesy of Apple.